One needs to be able to swim if one wants to compete in a Swimrun event, right? Well yes, technically one does! Yet when we signed up last year for the Breca Buttermere Sprint race, only 50% of our pair could swim. I was a very seasoned swimmer, having done several open water races and I frequently find myself in a 50m pool as part of my triathlon training. Yet, Helen could not even swim a length in a 25m pool…the definition of swimming is ‘the sport or activity of propelling oneself through water using the limbs’. Having spent 3 years at university together, I had it on good authority that she could certainly propel her limbs, but more in a dance-floor kind of a way. In the water? This was out of scope! We arrived in The Lakes, support crew in tow and quickly found ourselves in the ‘sprint’ race briefing. In all honesty, the ‘sprint’ was not to living up to our understanding of a sprint…we had concluded a sprint to be around 100m, think Usain Bolt…not a circa 20km gallop around The Lakes; through bodies of water and over large hill tops. Nonetheless, we LOVE a challenge and we were super excited to get going. Briefing done, new swim hat collected, selfies taken…nothing less to do but rest up and reorganise our race day kit about 25 times! The race itself was nothing short of superb. 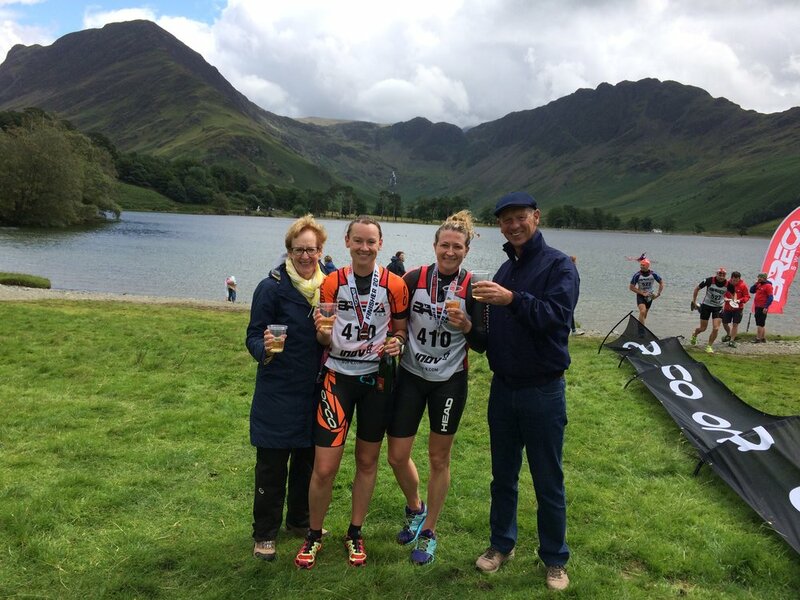 The setting, for those who have not been to The Lakes, was magical, the weather was, well…adventurous and our two proud supporters were ready with their six figure grid references of the best vantage points, homemade flags and the all-important champers for the finish line. As the starting horn sounded, you could barely make it out through all the excited chatter…and howling winds! We only really knew that we were starting by the movement of all the feet in front of us. Like Noah’s ark, off we went, two by two. By this point, you will be pleased to know that Helen’s swimming was a vast improvement from a width, yet as we approached the first (and longest) swim of the day, we looked at each other hesitantly. To our left was an almighty rain storm that was fast approaching, bringing with it a serious wind that had turned Crummock water into the Atlantic Ocean. Regardless, we threw ourselves in and battled the waves – just to ensure our safety, Helen was attached to me via a bungy cord, although given the waves I was not to see her again for another 1,000m! As we reached the far side of the lake and crawled out of the water there was an overwhelming sense of relief…we were on dry land and there was no more lake water to drink…for at least another 10 mins! Hairy section over, onwards and upwards, quite literally. The remainder of the race was cracking; we ran, we laughed, we ran further, up larger hills, we stopped to take in the view, but most importantly we embraced every second. Two girls [one who couldn’t swim 6 months prior], two questionably short wet suits and one piece of bungy cord…we smashed it! As we crossed the line we were overcome with emotion; I was bursting with pride for Helen and I think she was bursting with pride for herself. Damn right. We were both also gasping for a glass of champers. The entire event was fabulous. It epitomises the true spirit of adventure and ensures inspiring camaraderie at every turn. We are chomping at the bit to get back in August…if you are there, please join us for a champers on the finish line. Mollie studied sport science whilst at University, but through a slightly unplanned twist of fate has ended up working in an office. Currently working at Facebook, which as offices go is pretty vibrant, but it is not quite the mountain environment she was hoping for. 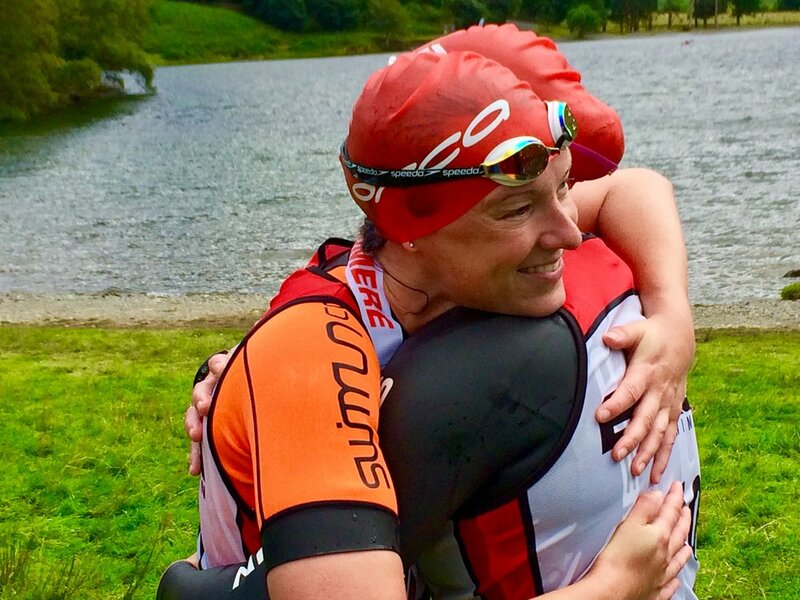 Mollie likes to escape the reality of working in an office by taking part in endurance sporting adventures, from Ironman 70.3 triathlons to endurance swims, 300km bike races around large lakes in Sweden and, of course, Swim Runs in the beautiful Lake District.